What does it mean when we refer to a rock crusher (either an existing unit in a plant’s layout or possibly a new-to-the-operation unit) as a “secondary crusher”? Does this mean it is the second crusher purchased or maybe just a backup to the main one? Is a secondary crusher smaller in size and considered less productive in what it is capable of crushing? 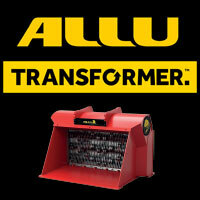 Let’s take a more in-depth look at this generic term of “secondary crusher” to determine what best defines this unit. Secondary crushers are generally the workhorse of the crushing circuit and usually have the most material entering the crushing chamber for the second opportunity to produce the desired sized material — sometimes even getting a recirculated load of oversized particles for a third opportunity until it is sized to shake through the screen cloth media of the crushing circuit. This small opening is usually 3/4” to 1” square so anything larger gets a third or tertiary run through if this circuit is a recirculating loop or closed loop circuit. Because of large production demands on the secondary crushers, it is not uncommon to see them using single and twin electrical motor drive packages exceeding 400hp and beyond. The cone crusher, which is defined by the shape of its crushing chamber, is recognized by some as being the most popular crusher designed for secondary crushing today. This massive horsepower is required to keep the eccentric crushing actions often found in the cone crusher moving in almost a hula-hooping action, creating a pocket for the larger material to easily enter under a gravitational effect, filling the chamber so when the gyration occurs the material is pinched and compression-crushed most efficiently. This hula-hooping action and the specifically designed shape of the manganese sacrificial wear liners has evolved greatly due to manufacturers and wear parts providers using collected data and material samples to produce an almost perfect particle shape — making today’s aggregates far stronger in concrete and asphalt mix designs than ever before. Both styles of high-speed impact crushers are also used as secondary crushers depending on the inside components the machine is dressed out with or how it’s configured to operate. The horizontal shaft impact (HSI) crusher is often used as a secondary crusher in a concrete or asphalt recycling applications, where vertical shaft impact (VSI) crushers are used as secondary crushing resources, mainly in virgin aggregate materials crushing applications. Either way, both of these machines can be utilized in multiple configurations and applications. The cone crusher has similar flexibilities under specifically controlled feed conditions and temperature ranges. 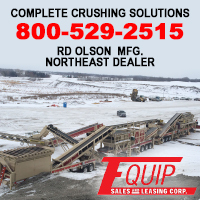 Roll crushers also offer a very positive secondary crush finished product and are often used in a single-pass configuration where the material being crushed is grabbed and pulled between two rigid set points, allowing for a minimal amount of oversized material to get through uncrushed. This process is more or less a pulverizing of the material between two or three large-diameter steel wheels that can be surfaced with many different styles of grabbing ridges or shapes to help with productivity and consistency. Secondary crushers came to life with rudimentary mechanical technology and an extreme amount of casting weight to combat the forces the machine faced in fracturing hard-rock stones, whether natural alluvial or shot rock-blasted quarry grade. The same basic-design crushers have become more productive and longer lasting due to the addition of some computer-controlled hydraulic features that adjust and track crushing pressures and temperature cycles, allowing the crushers to be operated to their maximum efficiencies — all while having maximum protection against failures and unexpected breakdowns. The constant desire to push productivity and continued improvement upon innovative features and inventiveness of secondary crushers will continue to create many other forms of crushing and processing markets in the future. This ongoing desire by many manufacturing groups of developing their own secondary crushing markets will only help keep improving the existing machines as we move forward. As the population and communities continue to grow, so will the need for more aggregate material production. If you enjoy these random aggregates and quarrying equipment-based subjects, tune back in for more topics to come. Send me a subject or topic you would like brought to light and any associated questions you would like to have discussed and I will gladly provide my best answer based upon my specific point of view and personal experience. Questions or comments? 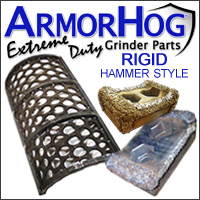 Email Tim Holmberg at prairiedawg@pdpractical.com or visit demiequipment.com . This entry was posted in Features, Features. Bookmark the permalink.